I’ve just finished reading Chris Hedges piece “The Coming Climate Revolt.” His closing paragraph is daunting. The response of the corporate state is repression rather than reform then our strategy and our tactics must be different. We will have to cease our appealing to the system. We will have to view the state, including the Democratic Party, as antagonistic to genuine reform. We will have to speak in the language of … revolution. We will have to carry out acts of civil disobedience that seek to cripple the mechanisms of corporate power. The corporate elites, blinded by their lust for profit and foolish enough to believe they can protect themselves from climate change, will not veer from our path towards ecocide unless they are forced from power. And this means the beginning of a titanic clash between our corporate masters and ourselves. Hedges preceding words detail a grim litany of usurped power by the “corporate state” that “perpetuates the facade of democracy.” Why I feel so daunted by Hedges diagnosis is that much of it unfortunately rings true. In the face of corporate and oligarchic power once again I feel like a Hobbit journeying to Mordor. I would like to stay in the Shires and not have to venture further into a terrible journey of confrontation, struggle and risk. I am also reluctant to move to this “reality check” while still coasting on the good feeling of our Peoples Climate March and its hopeful buoyant joyful exuberance. For now, I’m still digesting the impact of the last week as well as the implications of the challenges ahead. In the midst of that I’ve been talking with friends and teachers about our “Buddhist” piece in all this. Basically, we seem to agree that the reality of our current times is going to profoundly challenge Buddhism along with other Axial Age religions which forged many evolutionary shifts in their time. These focused on an individuated experience and relationship with the divine/ transcendent while also connecting that to an inner moral imperative. However they also shaped a profound split with nature in the tendency to posit “salvation” and “nirvana” as apart from this world. 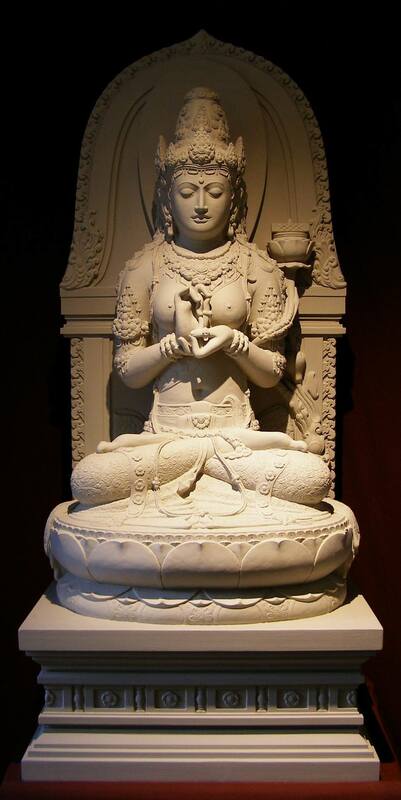 While Buddhism has followed its own evolutionary arch which dissolved that fundamental split in texts like the Heart Sutra, it is still deeply embedded in the philosophical template that sees the world as samsara and therefore “bad, seductive, lesser and corrupting.” It is this fundamental split and the rise of a patriarchal — earth and female averse — religious doctrine that contributes to our catastrophic and perilous situation. This new evolutionary arch is summarized brilliantly in Zenji Dogen’s statement Enlightenment is the intimacy of all things. 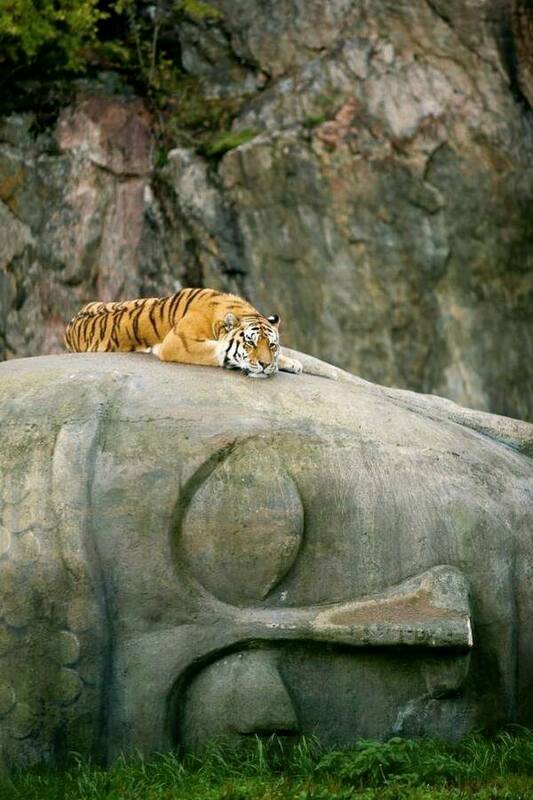 Buddhism, when at its best, has never divided evil and good but sees the origin of all dualities within our own mind. We have not launched holy struggles against “evil” but seek to purify our own heart and transform our own consciousness. In doing so, the Buddha engaged Kings and Generals and he sought to stop wars and social injustice. But he did so from an inclusive consciousness. So blog pieces should not be too long. To be brief here. While I believe Chris Hedges analysis – we have to have a revolution that takes down a rogue fossil fuel state machinery – how we do this is critical. We saw this last week that people power is indeed a brilliant power. We also saw that when it coalesce diversity, youth, grandmothers, indigenous peoples, workers, leaders, people of faith, and a variety of concerned citizens across the globe with creativity, joy, focus and determination, then we have found ourselves a movement. A movement that expresses our new evolutionary edge. We are warriors and we do have a battle to engage; but we will not default to hatred and violence (though we may feel both impulses.) And it is at this crux that Buddhism has a valuable offering to make. I hope we can get beyond our tribal sangha competitiveness, our narcissistic introversions and sanctioned quietism, our inner splits and entitled “whiteness,” and our fear of the sacred feminine enough to meet the coming wave. Our work is cut out! We the people have walked and we now speak for a reality which has been dangerously twisted, distorted, denied and suppressed by the corporate-fossil fuel-oligarchic owned media agenda. 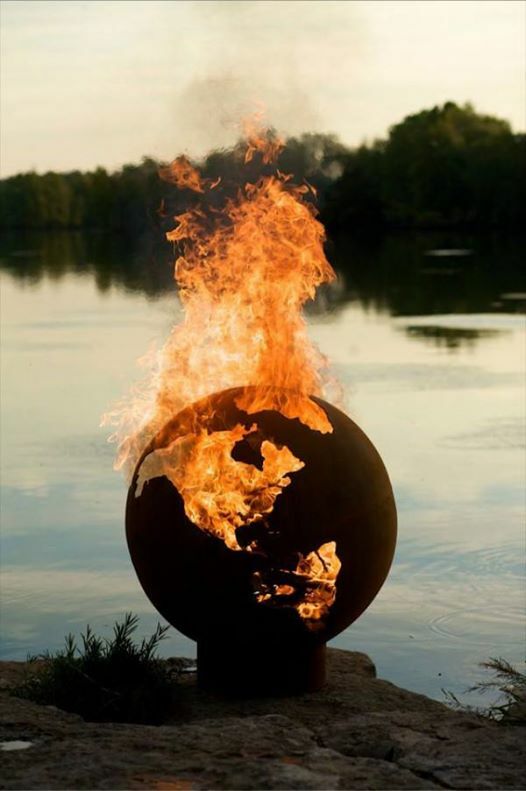 This reality is catastrophic climate chaos is upon us, it is real, it is happening, and if we don’t act now, we will destroy the biosphere and render the earth unsustainable for all life. There as no one on the 2,700 marches across the globe, or the 400,000 marchers in New York City that didn’t know this to be true. 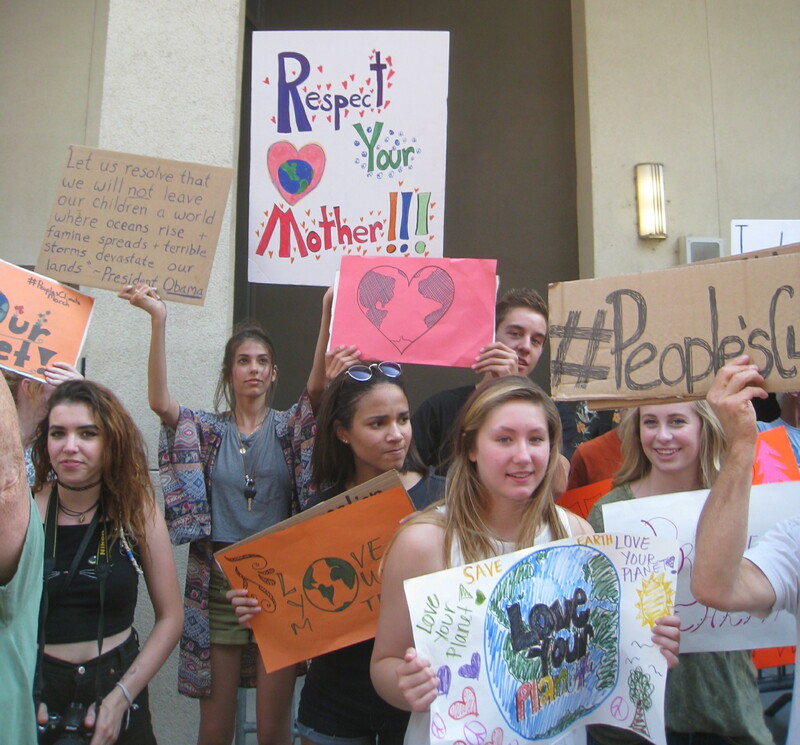 The march was a statement for political leaders gathering right now to talk our planetary future. Take another moment to watch this stunning opening offering from 26 year old poet Kathy Jetnil-Kijiner, from the Marshall Islands at the UN Secretary-General’s Climate Summit. 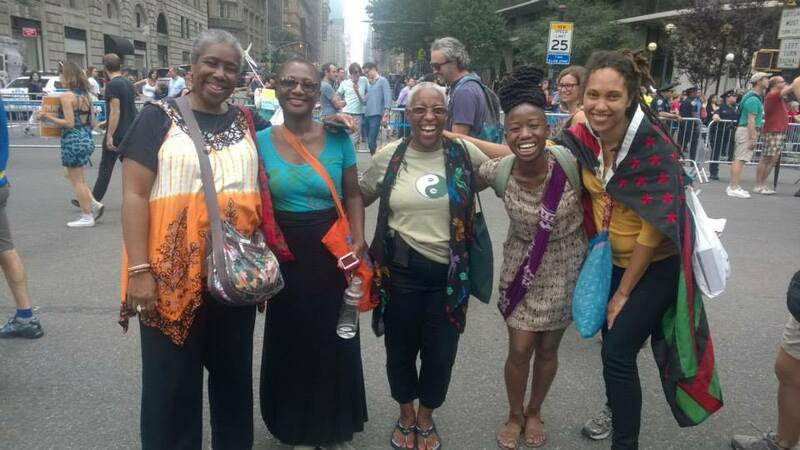 As world leaders hash it out in the UN Climate Action Summit, we need to acknowledge the true leaders that are among us which is the First Nation Peoples who led our 4 mile long (7+ kilometers) people march through the streets of New York. They know the territory, they understand the disease and they have the remedy. They have the remedy because they also understand we all have the remedy. We know this when we listen beyond our colonized minds to hear the deep, urgent impulse of sanity that is aligned to the heartbeat of the earth, of the ancestors, of the animals, and of the total web of life. This is the deep feminine primordial mother earth who births all things and who cries out to us now, each of us, to hear her urging. Stand up and be my protector. Do what you can, embody the sacred masculine and be a warrior-lover of the earth, of each other, of our best heart. 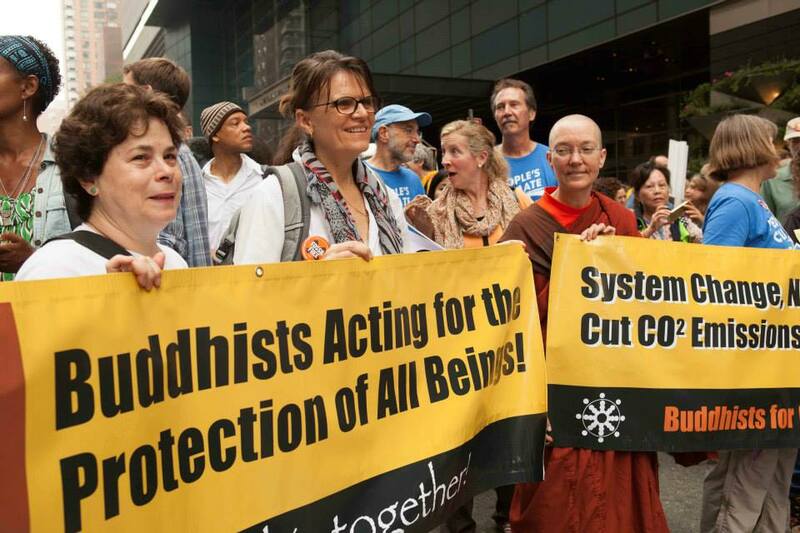 As a Buddhist practitioner it was especially great to see a strong gathering of cross denominational Buddhists turn up to align forces with People of Faith. The determination I felt on the march from those stepping out alongside me was palpable. We must go forward and work hard to secure our collective future. As we do so, we will see game changers happening. Already as the momentum for change is building, results are coming in. 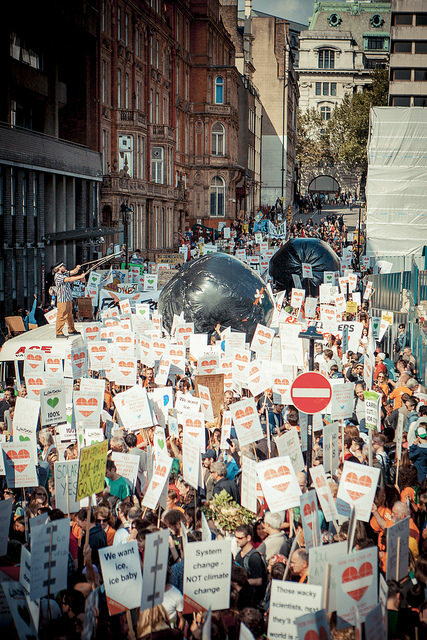 Divestments from the fossil fuel industry are happening fast. Yesterday it was announced that Rockefeller’s divested $860million, the World Council of Churches representing 590 million people in 150 countries have divested, 30 cities in the USA, Stanford is dropping coal holdings from its 18 billion endowment funds. (C’mon Harvard, you can do it!) Especially love Dogs for Divestment! Meanwhile investments in renewables is the leading edge in the market. 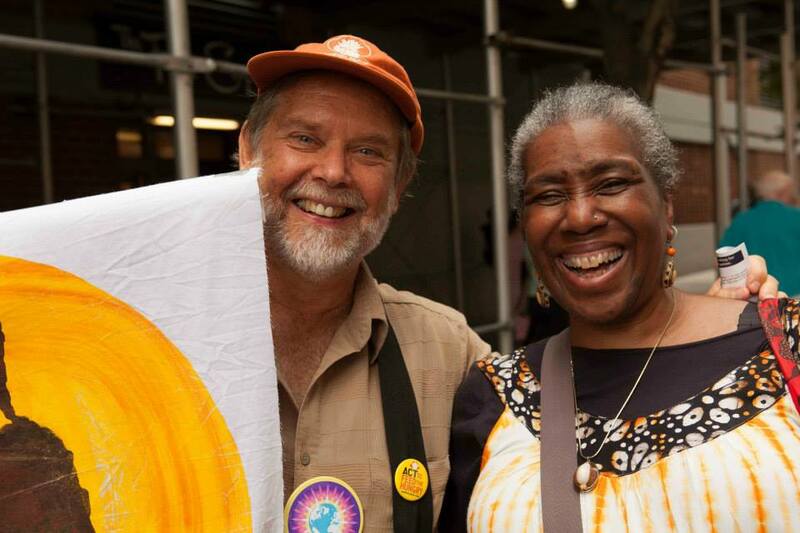 Yesterday I observed Flood Wall Street and had the honor of hanging out with David Loy most of the day as we walked with this activist happening. David was not averse to getting arrested (I was not up for arrest – not right now anyway.) As we became surrounded by police and as the march moved into a “sit down” David and I went for coffee, aware that it was turning into a long day with an inevitable outcome. As those on the front line aimed for the belly of the beast, our capitalistic-addicted-steriod-crack-pumped-disembodied-bull-market-machine, (commonly called The Stock Market), David and I talked Buddhist fem-eco-activist-evolution. More about that later, meanwhile, here’s David’s talk from the Eco-Dharma conference in August, Tale of Two Icebergs. Today was truly remarkable because of the really Huge numbers of people that did turn out, their enthusiasm, their creativity, their diversity (in the positive extreme), the enormous positive energy of this march that went on an on and on and on, it was fulfilling and hopeful. And we All have a lot of work to do to save our Home, our planet, our Mother Earth. This magnificent demonstration was the culmination of much planning and organizing, but Only the Beginning of the Serious Journey to be undertaken. May we all go forward shoulder to shoulder. Much love from NYC. 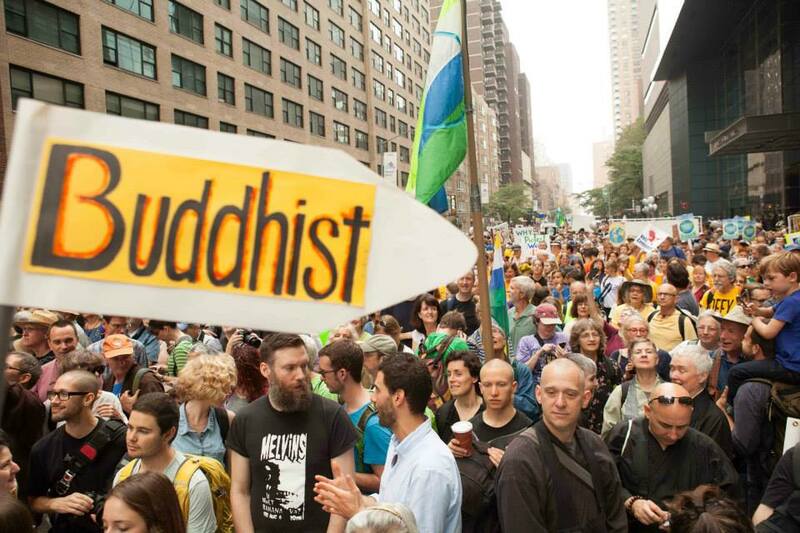 Friends, today in New York there was a seismic shift in the climate movement. 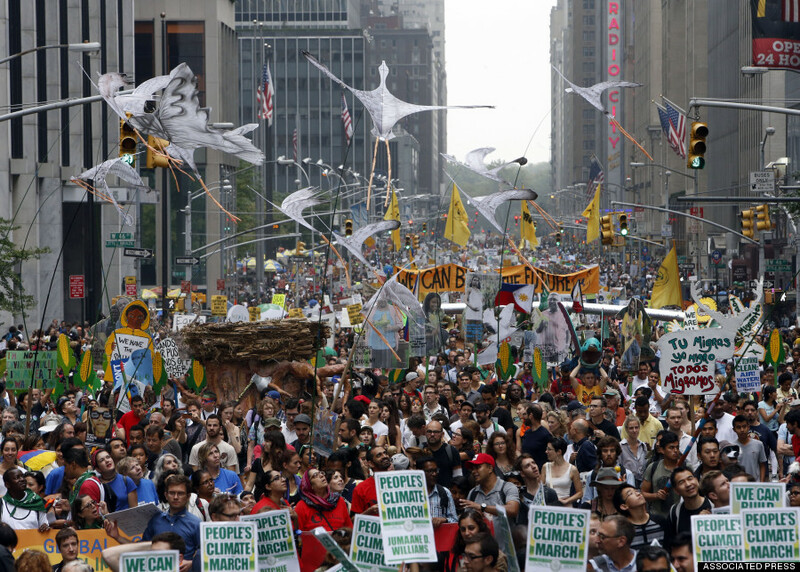 In its report Huffington Post estimated more than 400,000 people were on the street. Our message was clear. We want action now and we’re not going away! This is just the beginning. I was in the Faith block. When we first arrived it was pretty spacious, but we were a few hours early. 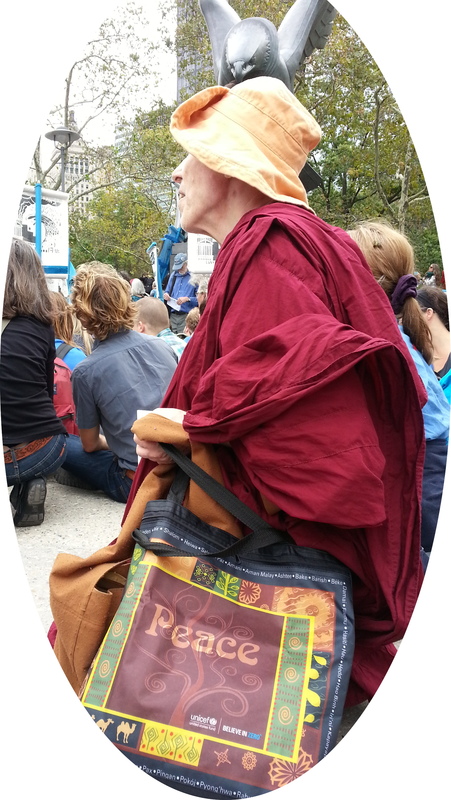 By the time it was our turn to march I was squeezed in check by jowl with Buddhist friends and barely able to move, such was the volume of people. (Fortunately it got more spacious as we began to march!) We were a happy, joyous, bunch, but also determined. We are the immune system of the Earth rising…I’ll have more to say but it’s late into the night and time to catch some sleep, so here’s two pics for now…Oh and an update from the UK and a brief snippet around the world. 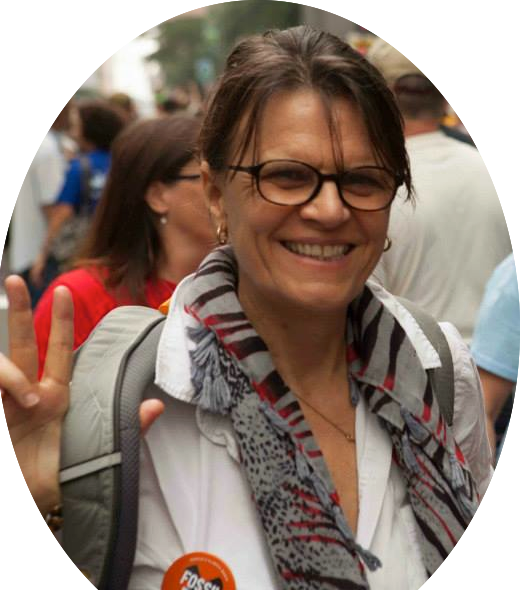 It’s late and it’s been a loooong day – so instead of writing an update myself, I’m going to post on from my dear friend Gayle Markow who will join the Peoples Climate March with us here in New York City tomorrow. Gayle and I have known each other for many years. Our friendship began early 2000 when she became central to our fund raising campaign at San Francisco Insight for Dharmagiri’s HIV/Aids community outreach work in South Africa. 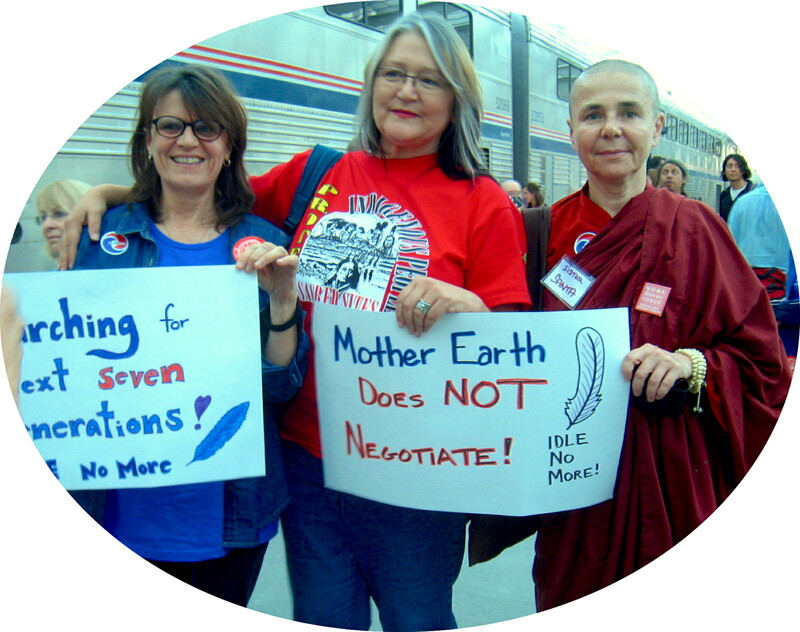 Now many years later we shared the journey on the Climate Train and today’s events which Gayle records here. This was at at New York Insight. 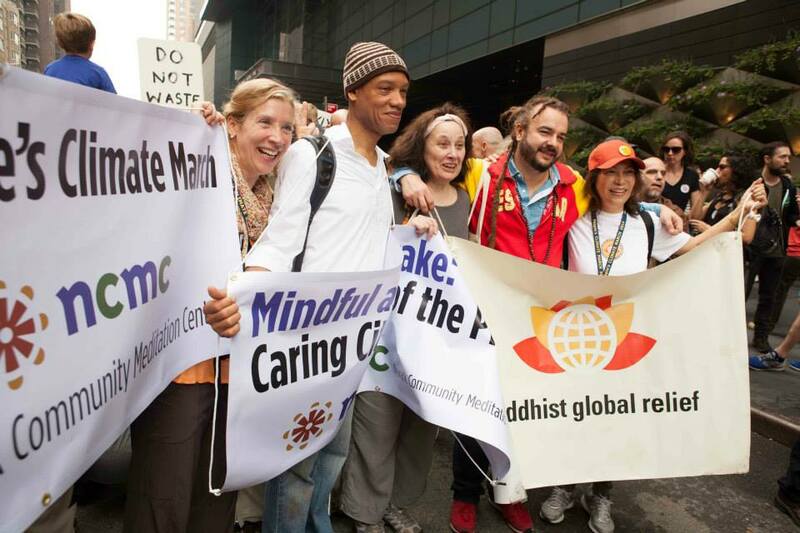 There were about 200 people from a diversity of geographical backgrounds, as well as New Yorkers, meeting to “Prepare the Heart to March.” In the evening we attended a symposium of climate leaders at New York Society of Ethical Culture. Over to Gayle. I got up, got dressed and hailed a taxi for Insight New York down on 27th Street. Turned out to be the MOST awesome 3 hour event. 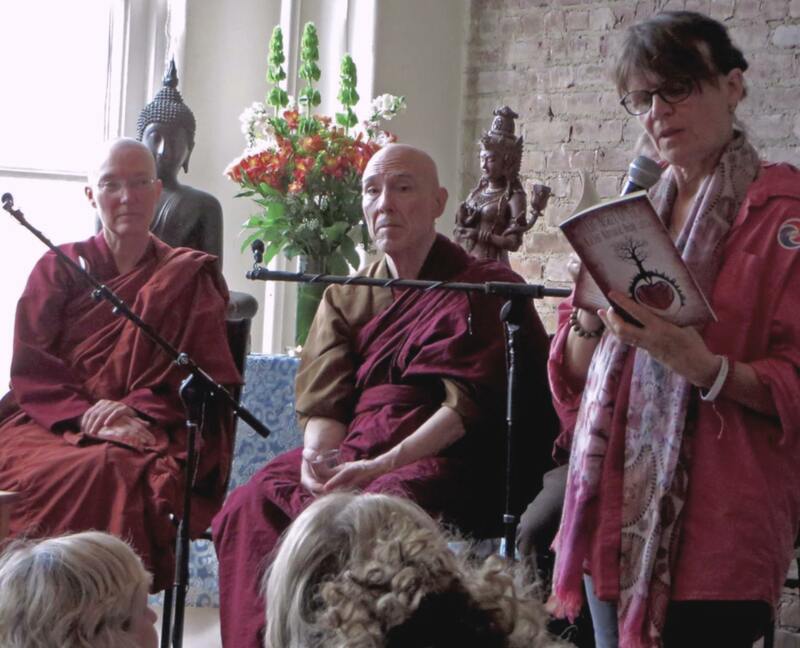 The two nuns (Ayya Santussika and Santacitta Bhikkhunis) who were on the train with us, Thanissara, Bikkhu Bodhi, Wes Nisker, David Loy, and some other brilliant speakers. It was Mega-awesome!!! A major event unto itself! At NY Insight, I “scored” possibly the last available ticket for Bill McKibben’s talk tonight. I never heard him before, or read him, but people spoke highly and I was curious. He was awesome. Then other speakers who were also awesome. Mary Robinson, first woman President of Ireland, and now UN Special Envoy for Climate Change (previously UN High Commissioner for Human Rights). There was Sean Sweeney, founder and co-director of the Global Labor Institute, etc etc… Other speakers All wonderful too. Too numerous to name here right now. 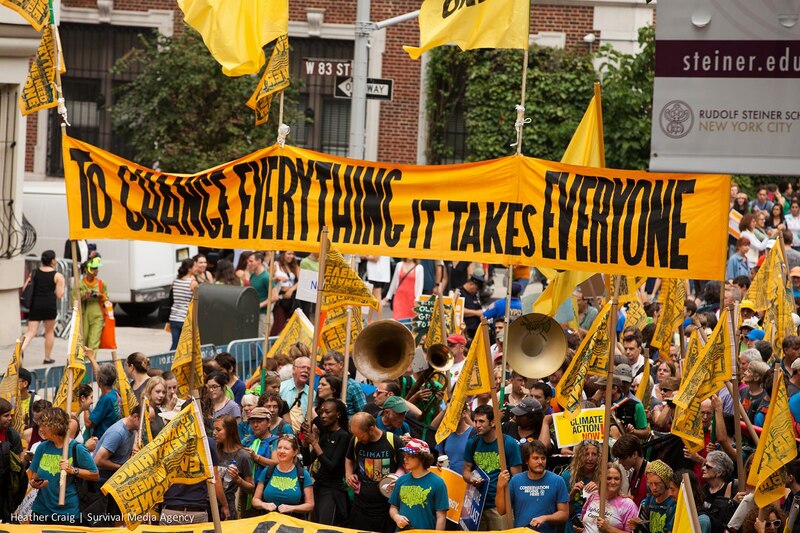 Sweeney said that ALL NY area Unions have endorsed the People’s Climate March. Bill McKibben said there will be more than 2700 marches and events going on around the world (150+ countries) this weekend in Solidarity with the Climate March. 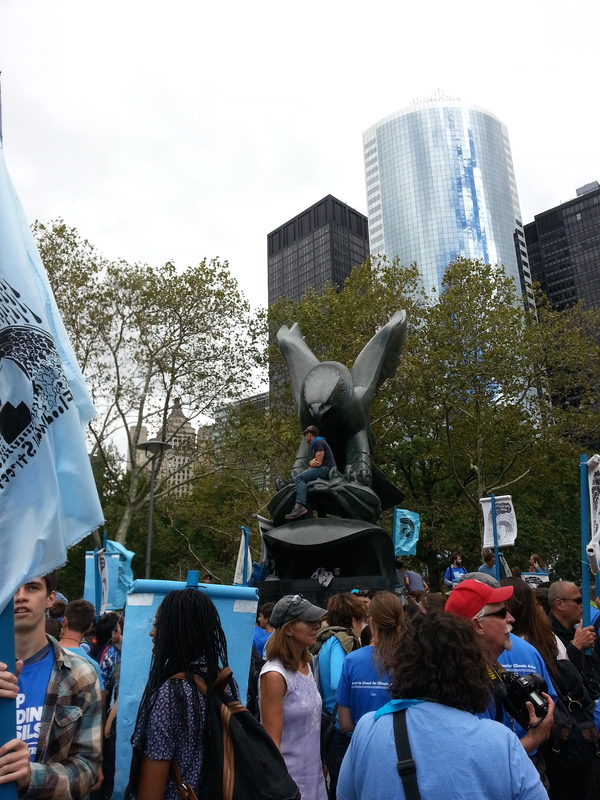 UN Secretary General Ban Ki-Moon will also be joining the Climate March. So much more got said, and it was all of intense interest, and the 800 or so people there tonight were electrified. The energy was palpable. 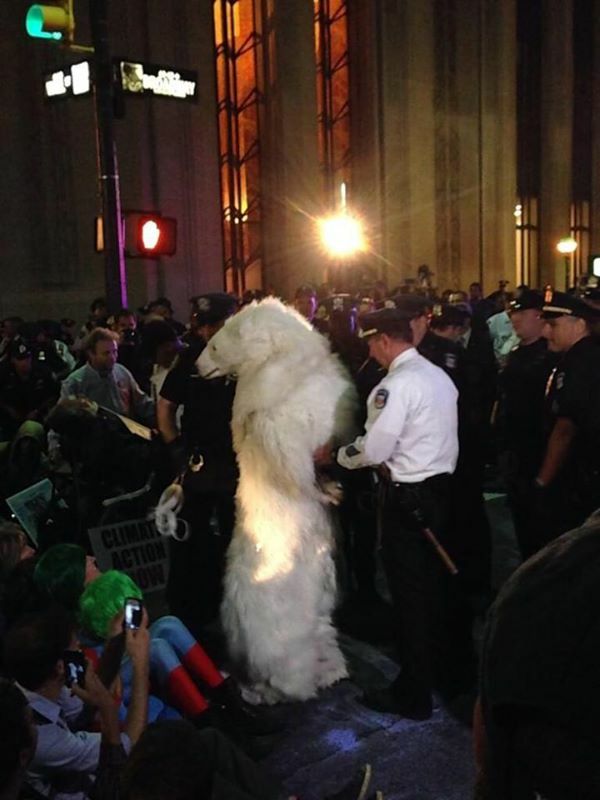 The Climate March is gonna be huge. Seriously. Huge. And it will transform the movement for change. This is gonna be a wild and interesting ride. Not just the march, which is gonna be Huge. But the next few decades. Because the Earth, and mainly the survivability of our human (and lots of other) species is Seriously at risk, like Never Before. We’re moving rapidly toward what they call the “tipping point” where it will be too late to reverse, to salvage things. It’s already not clear whether we’ve already passed that point, but there seems to be some hope that we haven’t, but that also we don’t have much time, actually hardly any time. Just to add onto Gayle’s report a mention the presentation at the NY Society of Ethical Culture by Lester Brown who is considered one of the world’s most influential thinkers. He gave a brief preview of his forth coming book which was packed full of truly inspiring data about the fast moving energy transformation from fossil fuels to wind and solar happening all over the world. Countries like Germany and Denmark are leading, and while lagging behind, the USA has the capacity to really fast forward this momentum, given the political will. Brown thinks that we’ll see a significant energy revolution in the next 10 years. Meanwhile, it’s important to keep the pressure on for change. Here’s more urgency from S.Africa’s Kumi Naidoo – ED of Greenpeace International, spelling it out on the eve of the Peoples Climate March happening all over the world on September 21st. Thanks to all who came to share the day and to Kevin Hansen for doing this video of what he called the “new anthem” of the Climate Movement – You heard it here ppl – at our New York Insight event which, as said by Gayle, was AWESOME! From Emeryville Berkeley CA to New York Penn Station, we were a tribe of nearly 200 diverse peoples, rolling along 3000 miles of train track through exquisite ancient lands. 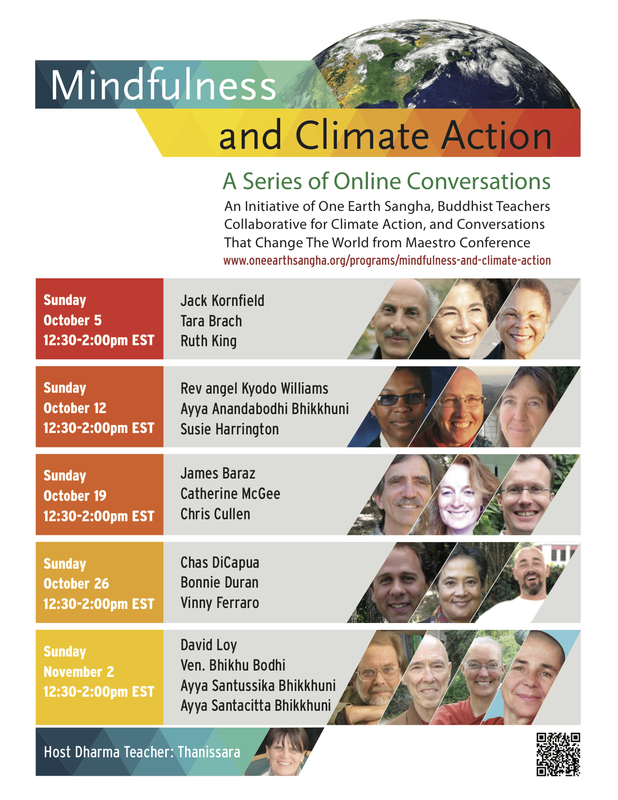 We shared fifty remarkable workshops with the energy of a movement whose time has come. There was clear diagnosis of the forces of destruction, a refusal to succumb to despair, a commitment to dissent, and a determination to see through the energy revolution now needed on our planet. Snaking through mountains, along riverbeds, past the stake outs of our Petro Empire – oil refinery’s, targeted fracking grounds, graceful and noble rivers, now polluted — we, First Nation Peoples, Faith Leaders, People of Color, white haired granny’s and granddads, tattooed and pierced beautiful youth, musicians, artists, scientists, political buffs, and even many of our Amtrak hosts, were of one voice. Climate catastrophe is now. We are the ones we’ve been waiting for. We wait no longer for the powerful to chart our suicidal trajectory. We the people are standing up for the rights of Mother Earth, for the return of the Sacred, for a USA and world that practices social and economic equity. We are unstoppable! Reflected in words of Elder Bing Gong, quoting his Buddhist master in a workshop on Eldership, we taste an exquisite flavor of our truth. As the train chugged on through the magnificent landscapes of the Rockies, we passed a meadow on our descent. Amma Thanasanti stood with a friend holding a wide banner cheering us on (picture will be uploaded later!) A very sweet moment! Today 1st Nation Elder John Pappan of the Omaha Indigenous Council NE spoke about time to listen to the First peoples of this land. They are the ones who have always been connected with the earth and who are guided by spirit to protect it. 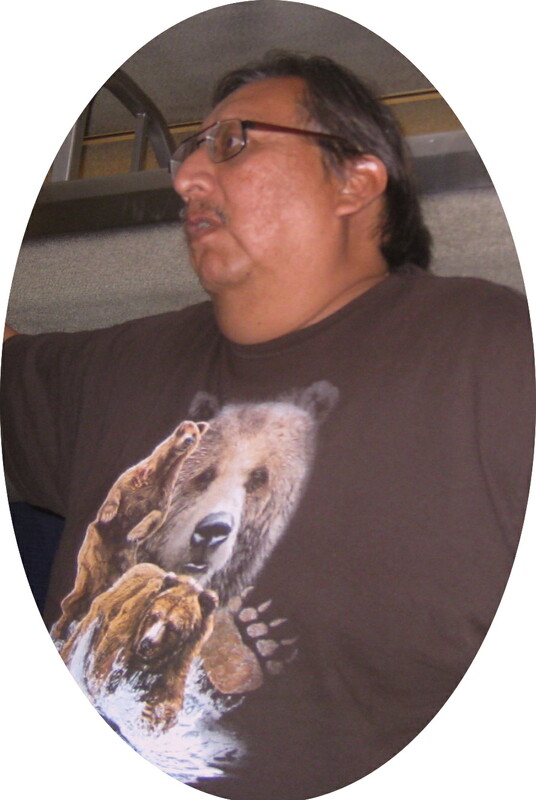 We are all now the “Indians” as our rights to a healthy environment are stripped away. And we are also all part of the same gathering, known for time immemorial by the 1st Nations, of deeper spirit who now moves within us to reclaim the sacredness of the earth, of the children, and of all living things. John spoke with great gentleness, honesty and encouraged us all to take the most difficult journey from “head to heart.” He said sometimes he gets “goosebumps” when he feels the new world that is on its way, as to the prophecy of his people. Represented were Christian, (Unitarian, Catholic, Quaker, Episcopalian), Buddhist (Theravada, Insight, Thich Naht Hahn), Jewish, Mohawk 1st Nation and others. Many points were raised which generated a web of connection that led us into a discussion about our times where there is no “other.” Yet at the same time, there are those who oppress. The core issue of how to meet violent oppression without enmity was spoken to extremely powerfully by 1st Nation Cherokee Pennie Opal Plant. 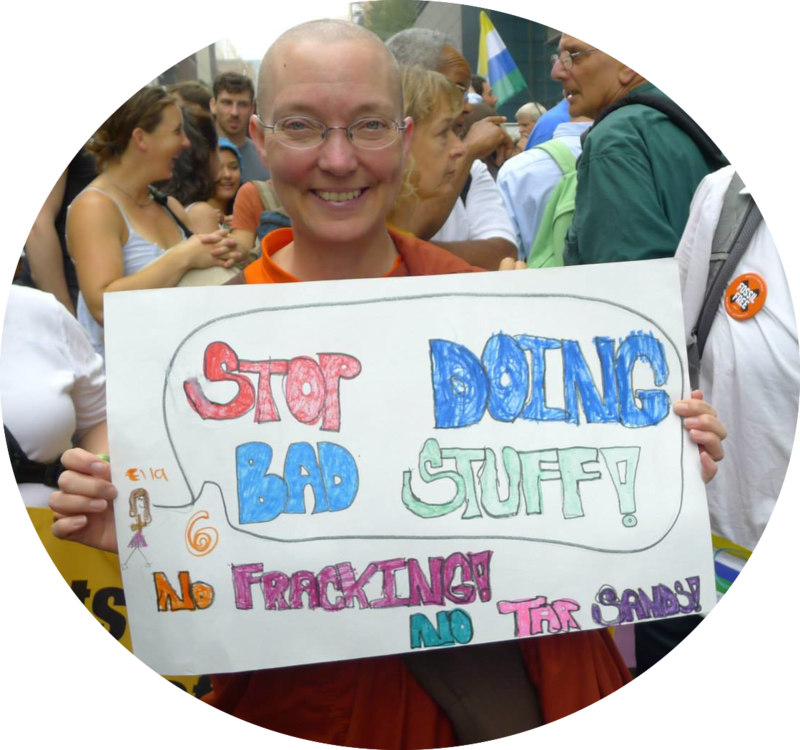 She has been on the front line, with many other activists, doing prayer circles outside of the Chevron plant in Richmond East Bay, a traditionally marginalized community. 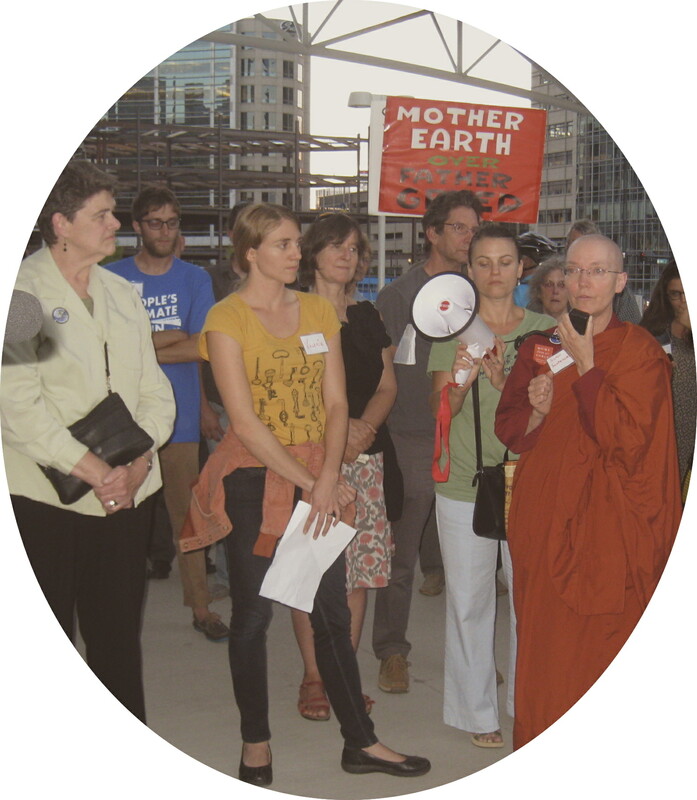 (Pennie noted that prayer circles rattled the industrial folks more than demos.) Pennie spoke of making a point of warmly greeting every police officer and Chevron worker before their acts of prayerful resistance. Over time some of the police have become their protectors. A young man in the meeting spoke passionately about how the police function as the oppressive arm of the corporate empire. How he witnessed tear gas cans being thrown at children during Occupy in Oakland. 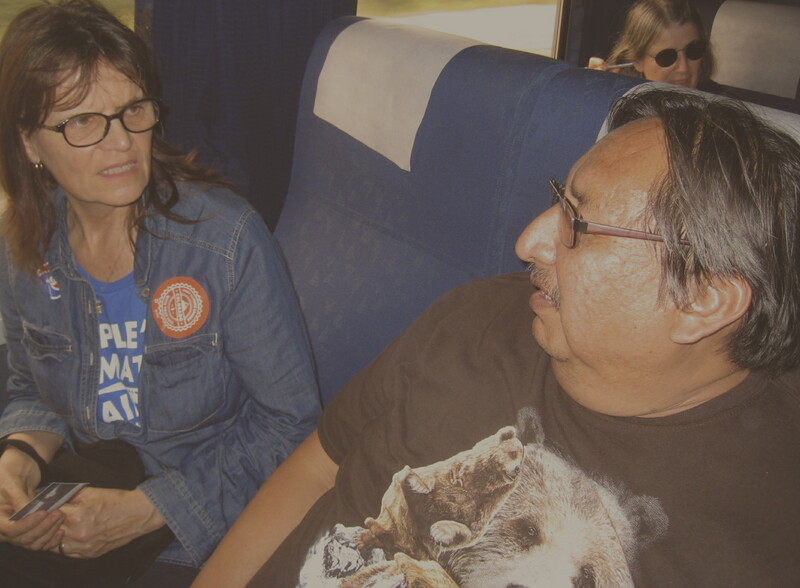 Pennie spoke of the need for the grandmothers – the grey haired ones – to lead, to be in front, to create the least violent atmosphere. It is hard for police to beat up a grandmother. She apologized for not being at the Occupy, that they were caught unawares, however, she stated, they would not be caught unaware again. If you are interested, here is a list of workshops on the train.